This is a sponsored post written by me on behalf of Iron-Tek. All opinions are 100% mine. This tart cherry coconut recovery smoothie bowl is packed with delicious, healthy tart cherries and hydrating coconut. Add your favorite toppings and enjoy post workout! I’ve been a smoothie bowl fan since before they were a “thing” on the internet. Why slurp your smoothie from a glass when bowls exist and you can load them with toppings? From chia seeds to granola, to fresh fruit, nuts and everything in between, there are so many ways to add texture, flavor and nutrition to your smoothie when it’s in a bowl. Sometimes smoothies are replacing a meal (if so, check out this post on How to Make the Perfect Healthy Smoothie) and you want to give them a bit of extra attention to make sure you have balanced macros and you’re getting some greens in there but, other times, smoothies are just a simple way to recover post-workout. What does “recovery“ even mean when it comes to food? I’ve always leaned towards pre and post workout nutrition being through real food, never one to really jump both feet into the supplement world despite the hundreds/thousands of products out there, many of which all my friends at the gym seem to swear by. If I can’t read a nutrition label and understand what’s going on and why in a supplement, I’m not taking it. It’s that simple. The tagline of this website is “wholesome. fit-minded. fresh”, it’s not just what I put out here on the internet, it’s how I (mostly) eat myself and unfortunately there aren’t many supplements I’ve found to fit that lifestyle. Iron-Tek, however, stands out as one of the few that does. 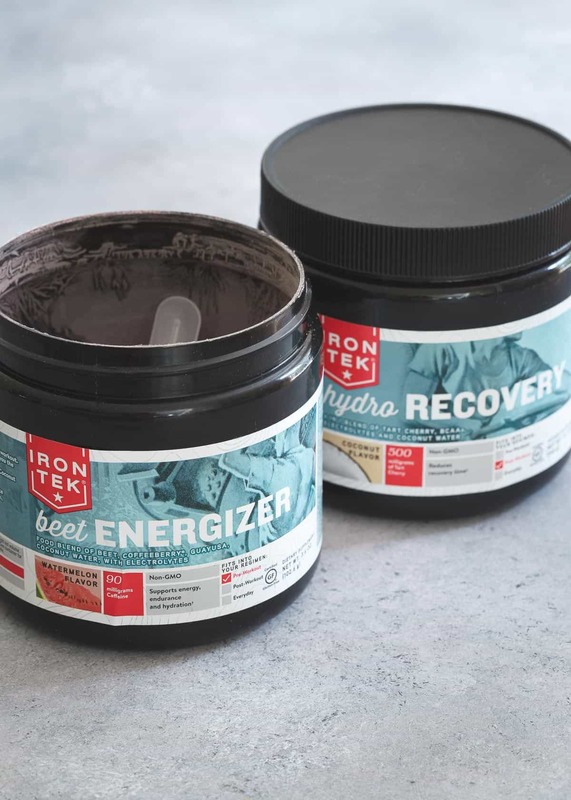 I recently got the chance to try out their Beet Energizer (pre-workout) and Hydro Recovery (post-workout), 2 products of their 3-part system. Besides the crazy, unintelligible ingredient lists of most supplements, what I typically find the most confusing is just how many products are out there! In my mind, supplements should be simple: pre-workout energy and post-workout nutrition. That’s it. It was refreshing to see Iron-Tek’s products structured around that mentality as well. Their products go back to the basics when it comes to workout supplements both with the simplistic system and the ingredient list. They’re also non-GMO, gluten-free and contain no artificial flavors or sweeteners. The Beet Energizer for pre-workout contains 90mg of naturally occurring caffeine from coffeeberry and also includes beets, guayusa and coconut. The Hydro Recovery for post-workout uses the power of tart cherries (which you guys know I already love – see these chewy tart cherry oat bars or this tart cherry fruit leather for more info on tart cherries and workout recovery), BCAAs, coconut water powder and electrolytes to promote the recovery process in your body and help rehydrate you after a workout when added to water. 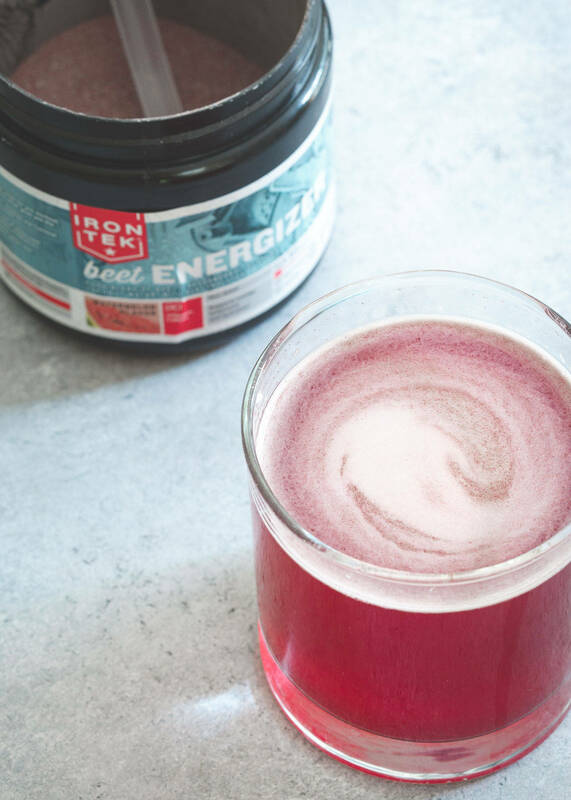 In the past few weeks I’ve swapped out my usual 3pm espresso for a simple glass of the Beet Energizer mixed with water and had great results in my workout energy levels. For post workout recovery, if I’m not eating a meal directly after my workout, I’ve been blending up the Hydro Recovery into simple smoothies, like this tart cherry coconut recovery smoothie bowl. There may only be 5 ingredients in this recovery smoothie bowl (1 of which is optional), but this recovery smoothie packs a big punch. With the Hydro Recovery, collagen whey protein, frozen tart cherries (yep, doubling up on the tart cherry goodness!) 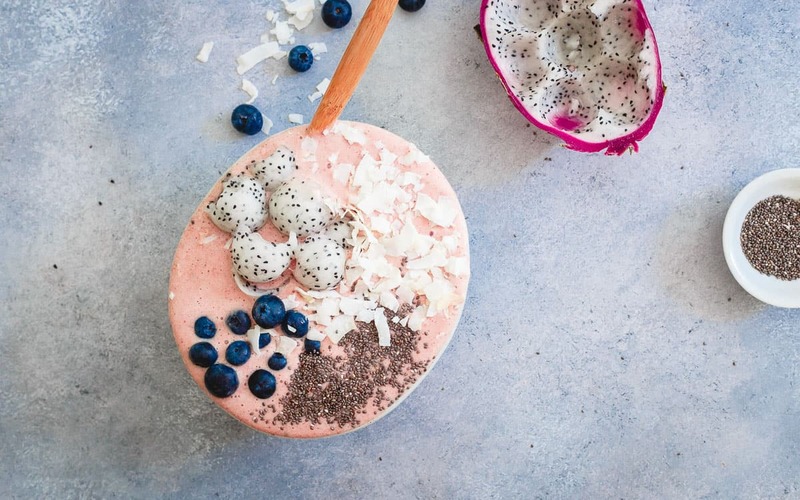 and coconut milk, this smoothie bowl has it all – protein, carbohydrates and hydration. Of course, you could simply drink it out of a glass and keep things simple but, I couldn’t resist the bowl approach especially after finally finding some dragonfruit at the grocery store. Love this recovery tart cherry smoothie bowl recipe? Try Avocado Pineapple Smoothie Bowl, Tart Cherry Ginger Muesli Yogurt Bowls, and Detox Green Smoothie. This cherry coconut recovery smoothie bowl is packed with delicious, healthy tart cherries and hydrating coconut. Add your favorite toppings and enjoy post workout! Combine all ingredients for the smoothie in a high powered blender. Blend until smooth. Pour smoothie into a bowl and add desired toppings. 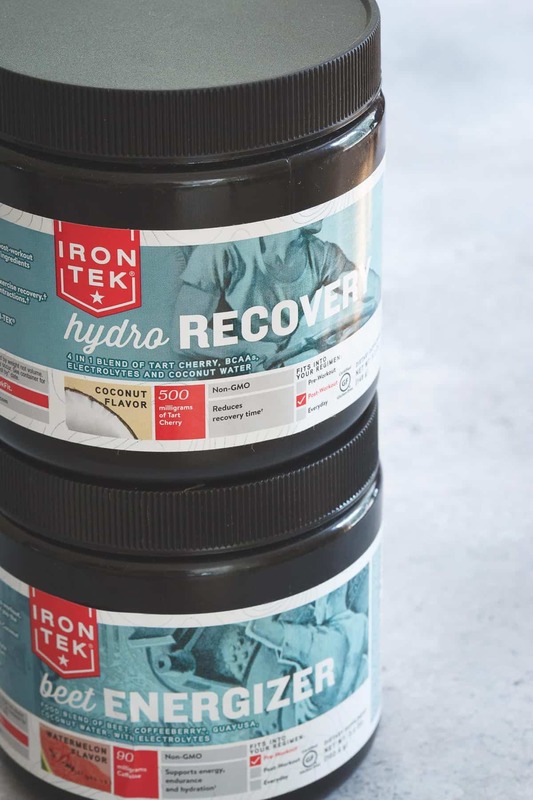 Connect with Iron-Tek on Facebook, Iron-Tek on Twitter and Iron-Tek on Instagram. Interesting stuff Gina! And delicious looking bowl too! I need some help in recovering after the gym, so this smoothie is perfect! I love the flavors you’ve got going on in here! And your photos are very pretty. I do like smoothie bowls, but I guess the internet is so saturated with them that I kinda stopped making them. A shame really! I should jump back in. I LOVE a good smoothie bowl! This sounds tasty! This sounds incredible! I was in need of a new smoothie recipe and this is now on my list of smoothies to make! 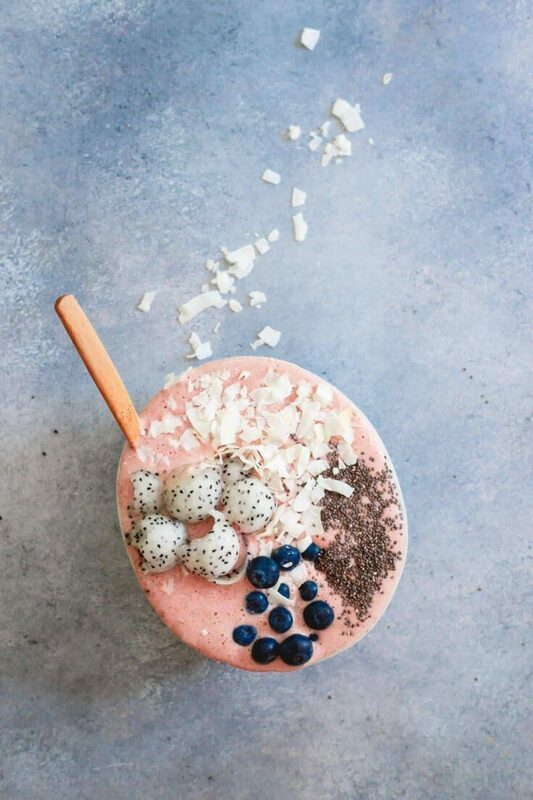 What a gorgeous smoothie bowl! love the color!! This sounds perfect and looks gorgeous to boot! I read this before my run this morning and was craving it during the entire hour. YUM! !